I have a 2000 prelude & I am wanting to put a MAGNAFLOW catalytic converter. I need to know what is the diff. between a hi-flow converter with no o2 sensors that is universal & one that is specifically designed with o2 sensors, which is better? I also want to dual it out using a MAGNAFLOW muffler. Again which MAGNAFLOW is best? its always better to get the one with o2 sensors because if your 02 senser is not connected, the check engine light will come on. Hey thanks on the o2 sensor! I thought they were ob2 compliant, but I can't have the check engine light come on! Hey i'm old school what is IMO & FTL? -sorry I don't know. on the dual exhaust I am going with 'vette style pipes. IMO is In My Opinion and FTL is For The Loss. Dual exhaust looks bad IMO as well. Doesn't dual exhaust on a 4 cylinder kill HP? i wonder if dual will help out in a boosted way..but thats a whole different topic. get the magnaflow. i got one to replace a pretty much hollow cat and am very happy with it. I believe so yes, unless you're turbo'd or have a really high compression ratio. Even with turbo I would not dual out the exhaust, I would however go with 3" piping all the way back. Anyhow if anyone has the old stock muffler lying around might be a little cash in it for you. i remember magnaflow is having problems with there o2 sensor, even though its new it might still throw a code i believe they are working on that problem. about the dual exhaust, wouldnt hat kill the ludes torque? with so little torque already i wouldnt get a dual exhaust but thats my opinion. i just swapped over from a test pipe to magnaflow high flow cat and i still throw a code but its not the bad cat code. its like sensor bank 1 blah blah blah. and get the one thats vehicle specific. it bolts right into place and you dont have to have flanges welded on or add O2 bungs. i like saying that. bungs. Hey is everybody forgetting about the s2000 here!! Its a lil 4 cyl and has dual exhaust. Lol, but yeah. 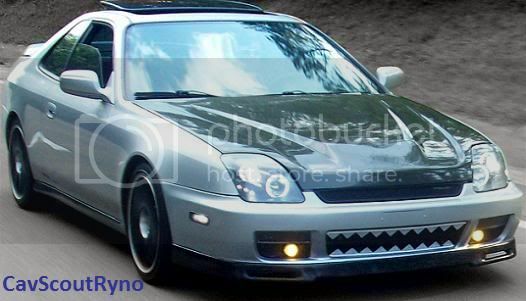 Imo, it wouldnt look good on a lude. But hey man, if u like it, go for it! I just saw 2 Caliber R/T's with dual exhaust & they are 4 cyl. Besides I think it will look different & good. I want to stay away from the coffee can look anyways. What single turbo kit is good & what twin turbo kit is good? Last edited by hotrod; 08-07-2009 at 01:12 PM. Reason: merging back to back posts. you should invest in a new "header" too, if you dont already have one. Yeah I will just that 1st things 1st: got a full body kit & a re-paint job on the car that I am waiting on. The body shop is taking their time ( which I am fine with, got to fix the driveway so that I don't scratch it ) they also took out all the dents & dings! got new halo headlights, new taillights. When I get the car back all the tags are expiered. Catalytic needs to be replaced. I talked to a mechanic that said if I do the exhaust @ the same time it would be cheaper! So I am going with a single muffler & dual it out from there. I have the magnaflow too and love it, you can usually get a used one on ebay or cragislist. I wanted a valid warranty so I got it here. Magnaflow 21009. Also some of the forum sponsors selling magnaflow usually have a sale going on. Either way its a great cat, sounds great, and very easy to install.